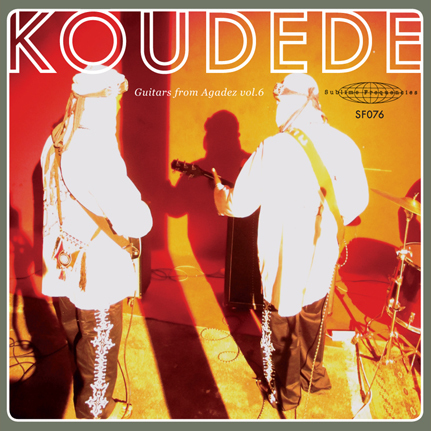 The second 7" from Koudede for Sublime Frequencies and the sixth volume in the now-legendary Guitars from Agadez series. The circumstances surrounding these recordings are the stuff of which legends are made: In January 2012, a major insurgency brewing in the far north of Mali turned Timbutku’s Festival au Désert into a heavily fortified spectacle. Just one day after the festival, rogue Tuareg rebels launched a full takeover of northern Mali, armed to the teeth with weapons from the Libyan war that ended in the murder of Col. Gadaffi, the spiritual father of the Tuareg in their struggle with the surrounding governments. By the time Koudede's group made it back to the capital city of Bamako—with Sublime Frequencies' Hisham Mayet in tow—discord had flared between the mostly Bambara ethnic south and the Tuareg community in the capital region. With a Tuareg exile already in progress, Koudede decided after much hesitation to follow through with a live concert at Toumast—the Tuareg compound in Bamako—in defiance of advice that all Tuareg should leave the city immediately. Recorded on location at Toumast by Hisham Mayet in January 2012, these two tracks are a scorching distillation of the urgency and fire in Koudede's music: the pure sound of his people and their constant struggles. 7 inch, Limited edition of 700 copies.